PHARR — The mayor wasn’t the only one wearing scrubs at Monday’s city commission meeting. Members of the Objective Watchers of the Legal System, a volunteer watchdog group more commonly known as the O.W.L.S., also donned red scrubs featuring their group logo, a pair of watchful owl eyes. When asked by The Monitor about the O.W.L.S. Monday, Mayor Ambrosio “Amos” Hernandez feigned not knowing who the group was and declined to comment, saying, “We like credible groups; if you ask me about those, I’ll comment,” before walking off. While he may not take the group seriously, two Rio Grande Valley lawmakers do: Last week, Sen. Juan “Chuy” Hinojosa, D-McAllen, and Rep. Terry Canales, D-Edinburg, honored the group with resolutions on both the Texas Senate and House floors. It was at that meeting the city moved public comment to the end of city commission meetings when commissioners have already voted on the agenda, unlike other cities where public comment is scheduled at the beginning before any action is taken. While the Hidalgo County Commissioners Court also holds public comment at the end, unlike Pharr it allows residents who have things to say about a specific agenda item to speak before commissioners cast their votes. “(The O.W.L.S.) should be taken seriously and those that do not take them seriously do so at their own peril,” Hinojosa said Monday. The O.W.L.S. have been around since the 1970s and have been invited to the Texas Capitol to testify on behalf on specific bills that impact not only South Texas but also the entire state, including those tied to voter fraud. A fixture at the bimonthly commissioners court, members of the group can also be regularly spotted at Pharr and Edinburg city halls, and have made recent appearances at Edinburg school board meetings. Over the years they have also watched the cities of Mission, McAllen, Weslaco and Mercedes in addition to the Donna school board and can be seen sitting in on notable hearings and trials at the Hidalgo County Courthouse. Pharr is the only city where they are not welcomed, McClaugherty said. The group, which totals seven active members out of about 20, goes to where it is called and McClaugherty along with O.W.L.S. 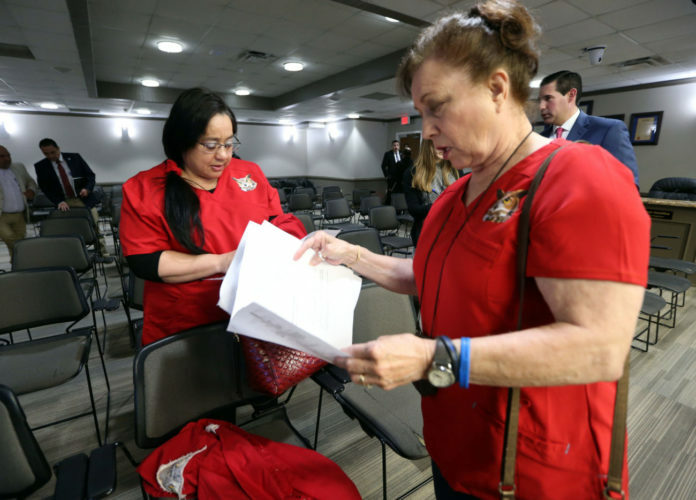 members Janie Melendez and Norma Saldaña began attending Pharr commission meetings last October after residents expressed concern about alleged lack of transparency during meetings, which have incrementally grown shorter. Whereas some cities spend two to three hours during their bimonthly meetings talking about agenda items, Monday’s Pharr city commission meeting was over in 14 minutes with commissioners voting on multiple items, including city contracts, without any discussion. “My thing is that if you’re that busy of a person you shouldn’t be the mayor if you’re not doing the job for the people of Pharr,” she added. “And hopefully more people will start getting involved in their local governments,” Melendez added. The O.W.L.S. routinely file records requests for city and county documents using the Texas Public Information Act and make sure cities follow the Texas Open Meetings Act. They have no special agenda Saldaña said, other than promoting good government.